Fossil fuel consumption subsidies include public aid that directly or indirectly lowers the price for consumers below market price. 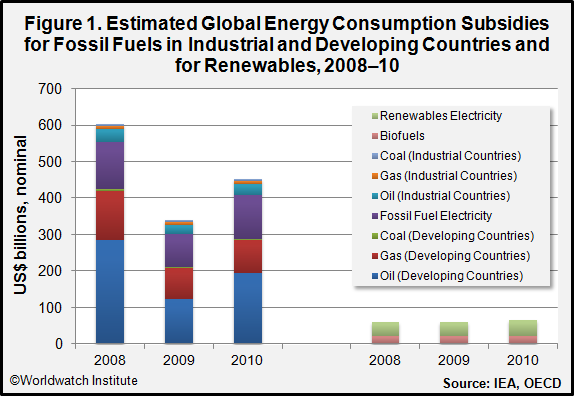 The International Energy Agency (IEA) defines energy subsidies as “any government action directed primarily at the energy sector that lowers the cost of energy production, raises the price received by energy producers or lowers the price paid by energy consumers.”[i] Common means of subsidizing energy include trade instruments, regulations, tax breaks, credits, direct financial transfers like grants to producers or consumers, and energy-related services provided by the government, such as investments in energy infrastructure or public research. [ii] Many observers believe that fossil fuel subsidies should be phased out because they reduce the competitiveness and use of cleaner, alternative energy sources . Please find the full article [here].